Seven-year-old Tyler can sing a beautiful rendition of “Happy Birthday.” Jacob tells hilarious jokes. 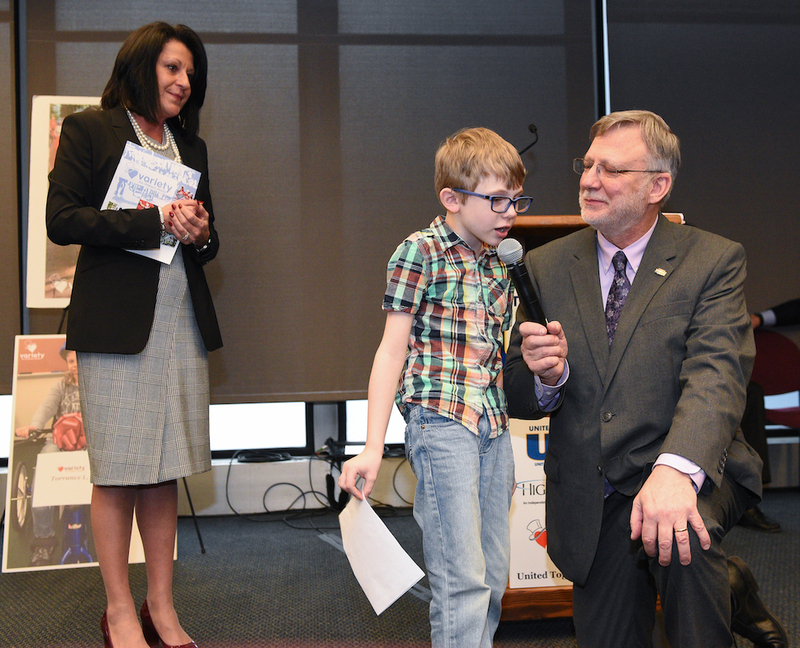 Both shined Tuesday at an event at United Steelworkers headquarters where they shared their voices – voices they did not always have – to help promote Variety the Children’s Charity. The charity helps children who otherwise could not speak get communication devices that use technology to produce words. The charity also provides adaptive bikes and strollers. They were joined by USW International President Leo W. Gerard, who called on the state of Pennsylvania to explore ways to make the devices available to more families who need them. The USW has sponsored several devices and adaptive bikes through Variety, and Gerard has helped spearhead major fund-raising for the charity. Children of USW members have been among the recipients. “The difference we can make for these children, to be able to help families and help young men and women have a pathway to a better life is very rewarding, and what we as Steelworkers believe in,” Gerard said. Tyler Winfield was non-verbal because of a developmental delay until he received his iPad two years ago. The union paid for the device, which allows users to tap on photos and icons to form sentences until children are able to spell out sentences on the keyboard. Once he received his device, Tyler literally found his own voice and now can speak without the iPad. At Tuesday’s event, Tyler used his own voice to sing to LaVallee, who was celebrating his birthday. The performance brought many to tears. Between the iPad, case, apps and support, each costs about $1,200, which Variety funds through donations from individuals and organizations like our union. Variety also provides adaptive bikes, customized for children's disabilities, and strollers intended to help families move around with a child where a wheelchair would be too cumbersome. Jacob Buchheit has both a stroller and a speaking device, which he used to share a Pittsburgh-friendly joke: “Why should you date a girl from Philadelphia?” he asked. “Because she’ll never expect a ring,” he finished, drawing laughter from the audience. Jacob’s mother, Eileen, said hearing her son’s voice has been life-changing for everyone.